Looks. Laughs. Local. Friday ‘Fessional: Fashion Week of Rochester … And I’m Still a Vintage School Marm. Boutique Crawl. I’ve no clue how I missed signing up for Thursday’s romp ’round Rochester to tons of our incredibly unique, fashionably fab, on-trend chic, luxuriously local boutiques … but I did. Yet, between 4:30pm, when I exited work, and 6:30pm, when I arrived in West Irondequoit for some volunteer work, I managed to sneak-a-peek at what will become one of my most favorite fashion boutiques ever. Roc Biz at its Best. Peppermint Grab Bag: Cute Bag. Tribal Bracelets. 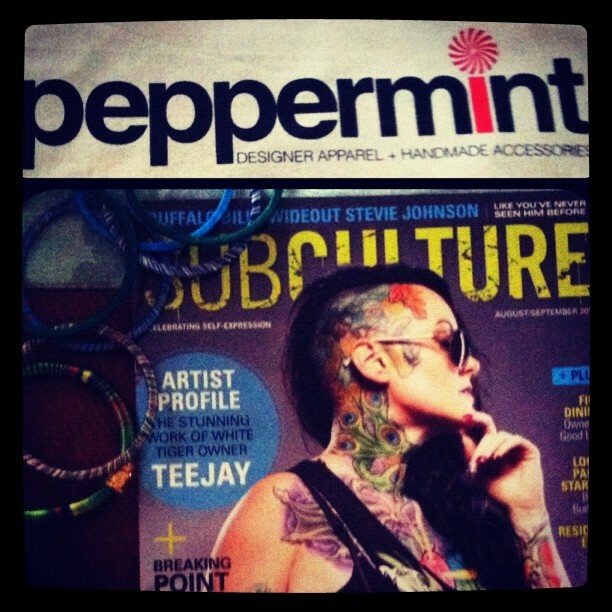 Subculture Mag. Fresh woman’s apparel. Local artisans’/designers’ goods. Literally down the street from me. They have a blog!!!! Local artisans!? Fresh apparel!! Between the vintage dresses, artsy jewels, & funky twists on classic purses, alone, this shop is a sweeter staple than the refreshing candy for which it’s named. So Shop ya soon Peppermint … like every single Tuesday when Peppermint offers 15% — FIFTEEN PERCENT — off of all — ALL — merch, even if it’s on-sale. Did we register this??? Even if it’s on-sale. Like on Facebook. Follow on Instagram. 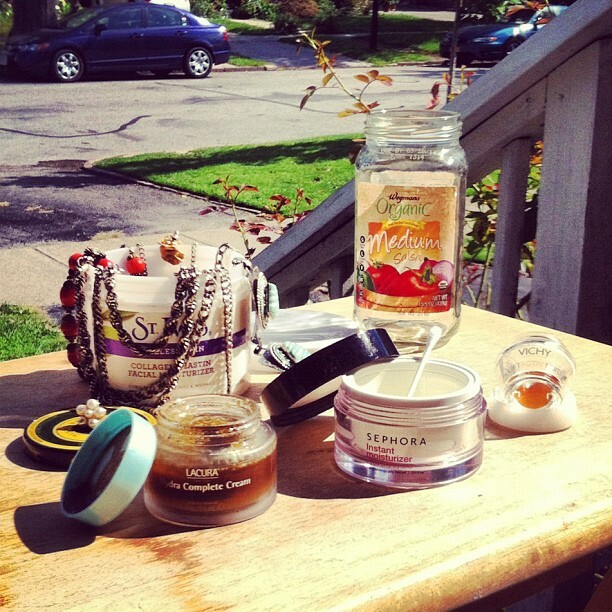 …Who said Fashonista Fab breaks the bank? Why I’ve gathered you all here, today. Funny thing is, while this ensemb certainly met all of the above criteria, and while I certainly felt professional & on-trend at work & chic & comfortable while volunteering, I felt, well … like a Vintage School Marm while Shopping Peppermint. 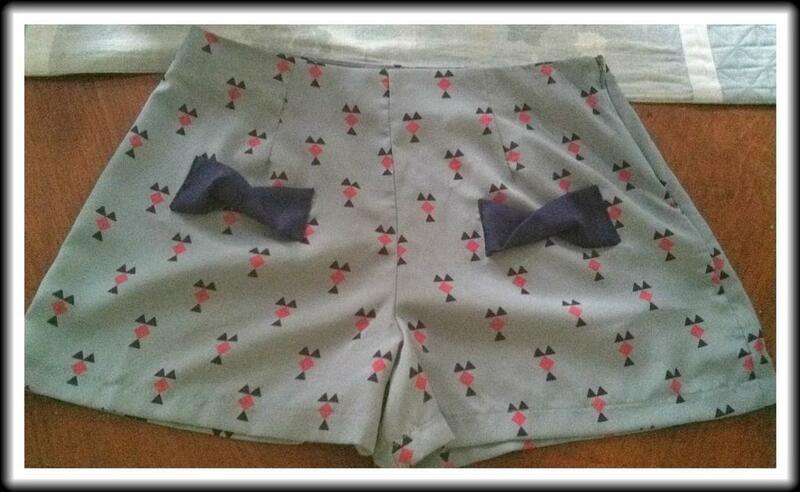 Vintage ’40’s Style Shorts on sale for $10!! Long story short, in my self-conscious, #vintageschoolmarm mind, the gorgeous, funky, chicly fashionista owner who checked-out our purchases, handed a discount scan card to Nicole & not to moi. Obv b/c Nicole looked way cuter and me, way 40. So. Standing up for myself, I asked for 1. Twice. As in, the 1st time I asked, both Nicole & the owner just kind of stared, an–Ah. It’s not the discount. It’s a scan code that brings you to our Facebook. Which you just said you already found.–mouth agape. The second time, when I repeated myself verbatim which is always the best way to clarify yourself…, the owner spelled it out for me. Nicely. No condescension. I got the point. Namely: Card is not the discount. Liking on Facebook is. Sometimes (lots of the times), I am a self-conscious, awkward, weirdo. Who buys culottes. Which is the only good part of this. Forgive me, fellow shoppers, for I have been awk. Looks. 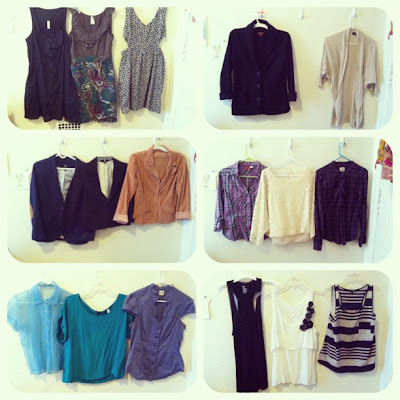 Fall Fashion Favorites 2012. Alright fashionistas. It’s all about texture. Leather. Wool. Silk. Chains. And it’s all about shape. Boxy. Skinny. Structured. Sleek. So heat up some cider. Snuggle into that blanky. Pretend like it’s raining (unless it is). Visualize a few multi-colored pumpkins: coral, white, gray, & navy. (Why not.) And let’s fall into some fashion. Outfit from Fall Fashion Favorites selections. Stretch cottons. Slimming stripes. Co-ed chic. Back: Long-Sleeved Cream. Wool with Side Zipper. Sweat Shirt. Front: Favorite Gray V. Pouf Sleeve. Breton. All Three. 1. Shop at Big-Lots?? 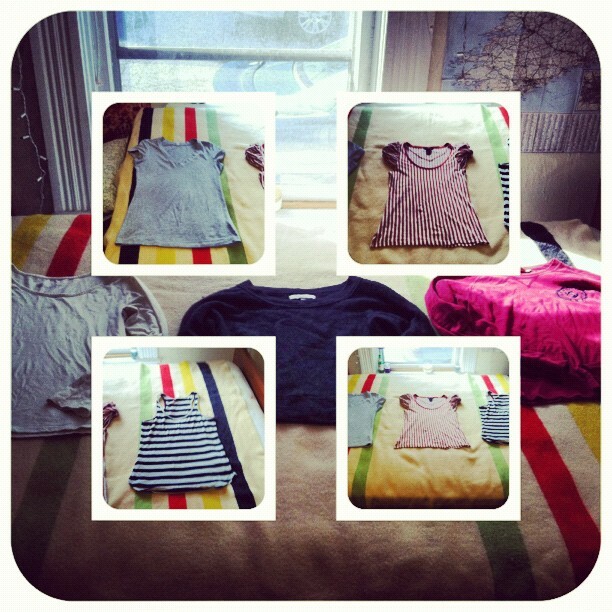 And find a gray V-neck T that keeps it shapes after multiple wears. (Febreze.) … That Gray T? A Momsly find from Big Lots. (I know!) 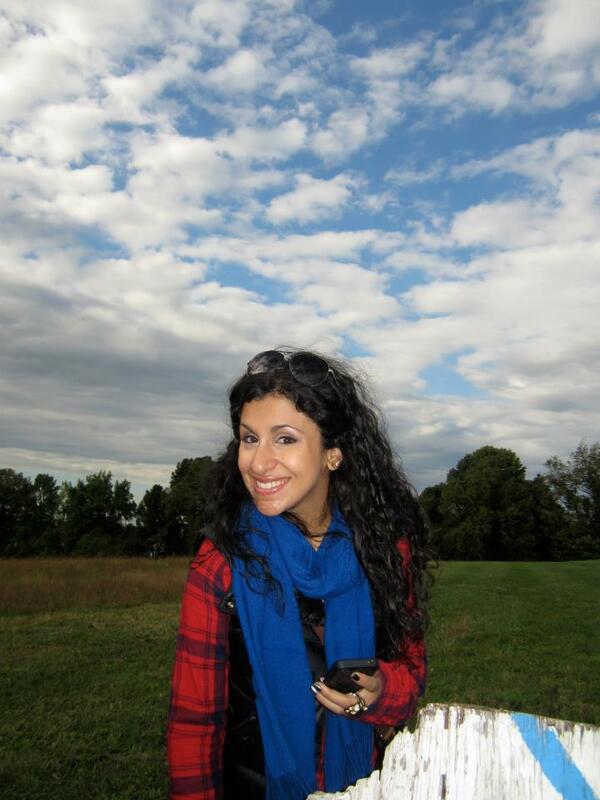 It is my most favorite, most chic, most versatile piece in my entire wardrobe. To work with a black pant. Fav bar with a high waisted black skirt. Brunch with some blue skinnies. …You get it. 2. I even wore the red sweatshirt-like (AE) long-sleeved shirt to work on casual Friday. It required a sophisticated cropped black pant (see below) & some pearl earrings. But this sucker I’ve had since senior year of high school, so. That’s staying, power. Rolled cuffs. Skinny silhouette. Denim, blue, & grays. 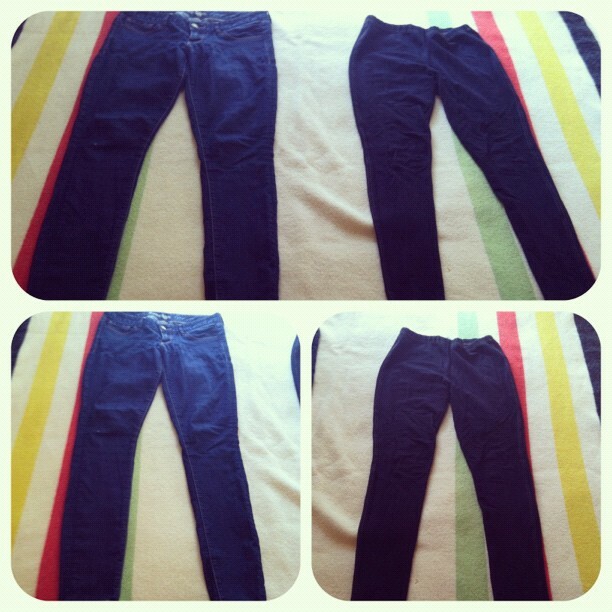 Clockwise Left: Denim skinny, ankle length with roll. Gray LOFT stretch, tight skinny cropped. Blue HM denim, relaxed skinny cropped with roll. All three. 1. Jeans too long? Roll them. 2. Don’t be afraid of a skinny jean that fits tightly to the skin. (Coming from a gal who has cankles… .) The less material at the ankle, the better. Creates a lean, slimming line. 3. Pick something with a good amount of stretch, & walk-it-out. Patterns. Luxe. Structure. Lace & Plaid. Sheer. Classic. Top: Dresses with waists, ruffles, cut-outs, & florals. 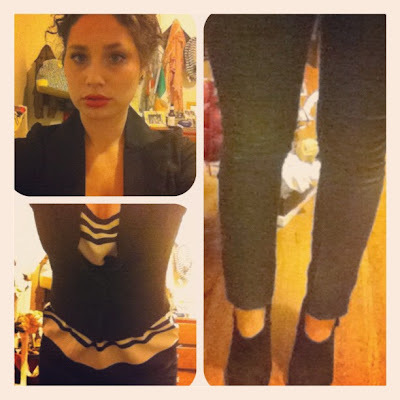 Middle: Blazers with stretch, elbow pads, & sleeves that roll. Bottom: Blouses with accents, surprising lines, & monochrome. 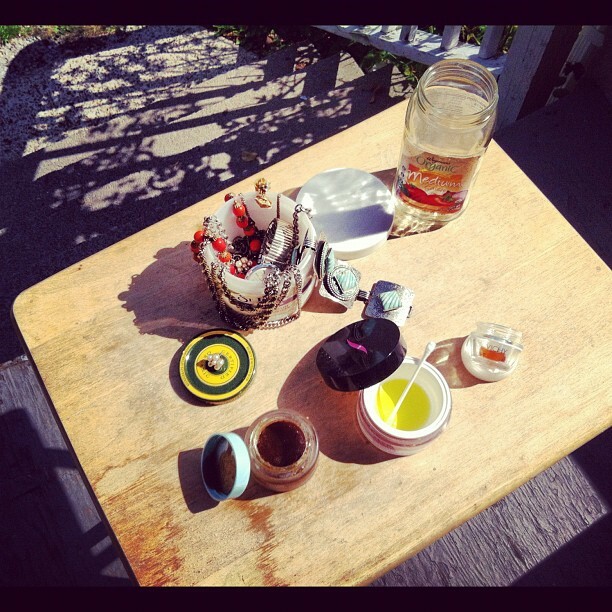 Shells to lay gracefully over your skin, that can stand alone. 2. Work with bold patterns, especially when they’re color-blocked by a neutral. You’ll be surprised how much of a staple, season after season, a piece like the gray-paisley Anthropologie dress becomes. Especially because it holds the classic shape of a sheath dress. 3. Find a quality blazer. Now. (Bend your arms a few times when trying on to make sure shoulders feel comfortable. If they do not. Put it back. Move on.) You will wear it almost everyday & probably out at night, as well. 4. Plaid. Do it. Lace. Wear it. 5. Sheer blouses. Go go go. Even if you don’t wear it to work (or yet), you will wear it out. Also, find a blouse with a varied neckline. Move away from the collar and the plain ole’ V. Get inspired by vintage lines & looks. 6. Invest in shells. Tanks. What have you. Not just season after season, but year after year, you will use these in your wardrobe in infinitesimal ways. 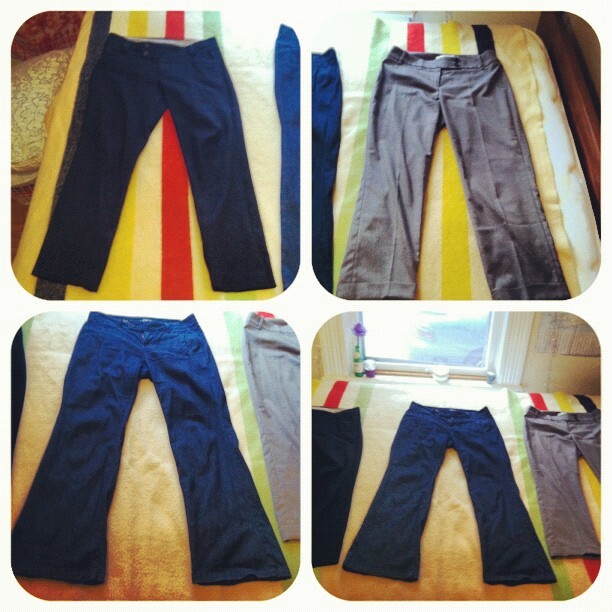 Clockwise from Left: Cropped black stretch pant. Cropped, cuffed tweed pant. Denim trouser-style flare pant. 3. Slim silhouettes are in, yes. But if it’s denim, and it’s creased, think about a flare. Thank you ’40’s. Clockwise from Left: Pleated, patterned skirt with belt. 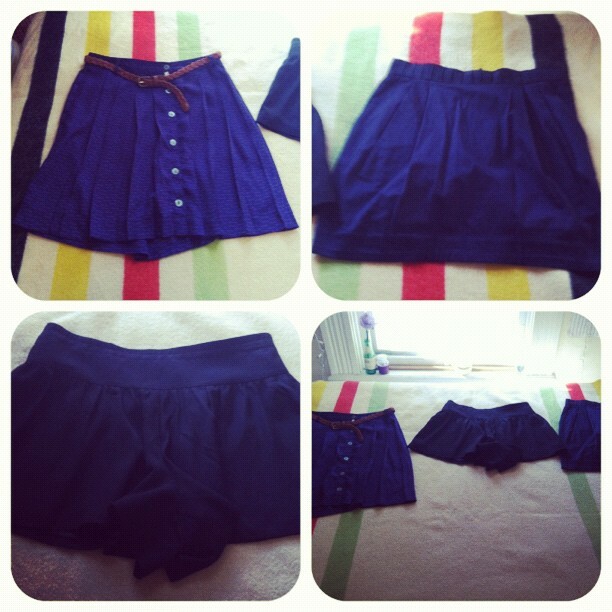 Pleated, high waisted skirt with pockets. Black culot with high waist and pockets. All three. 1. Patterns, pleats, & bobs. This Target skirt has it all, even pockets. (Even better.) 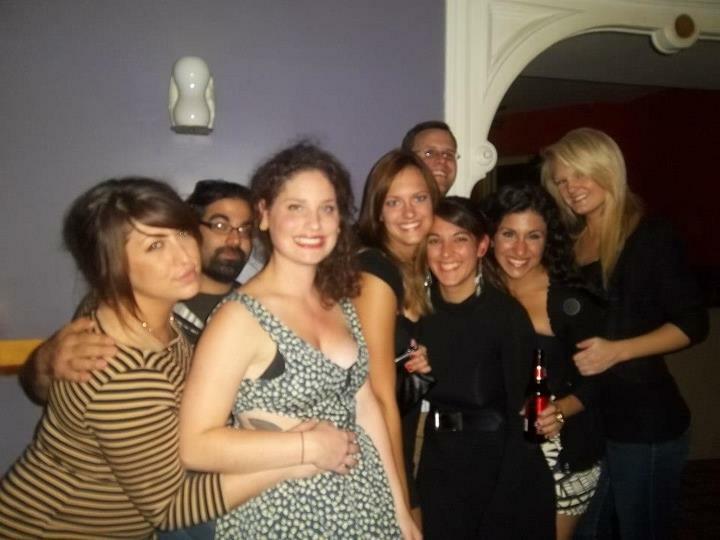 In this pic, you can’t see the old-fashioned key pattern. And that’s good. When you have so many cutesy, fashion things going on, make sure that at least one of them is subtle. 2. 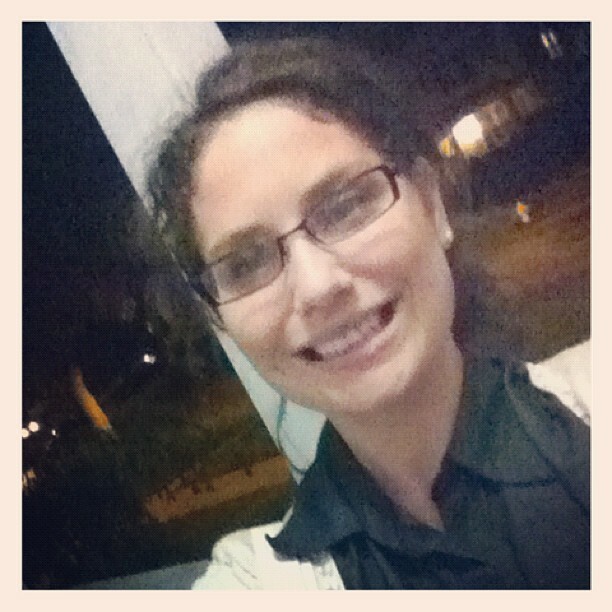 Go school-girl. But make sure it’s quality shape & quality material. Look adult. Not cheap. 3. Buy a culot if it is on sale. Then wear it & notice how it does not rise up in between your thighs whenever you walk. So pair it with tights, get your ankle boot on. You don’t look like your Kindergarten teacher from the early ’90’s. You look hot. And sophisticated. And surprisingly comfortable. Boots. Bags & Pashs. Jackets. Jewels & Bobs. 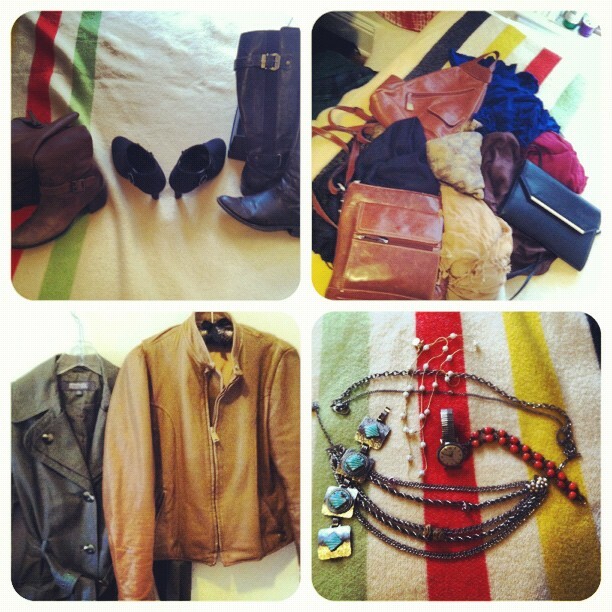 Clockwise from Left: Riding boots. Ankle boots. Buckles & boots. Leather bags. Vintage bags. Pashminas in neutrals. Trench coat & leather piece. Turquoise, corals, chains, grandpa’ watches, pearls, & roses. 1. Buckles on boots. Dark leather-like riding. If anything. 3. If you see a Kenneth Cole trench on-sale post-season, you will buy it even if you think it’s above your budget. Because it will be the biggest investment piece of your life. And then, you will save it for future generations to come so you can somehow, someday bequeath it to your daughter, & she can then blog about the genuine ’70’s leather jacket she now owns. 4. Go to church sales. Buy the old lady jewels. You look good. 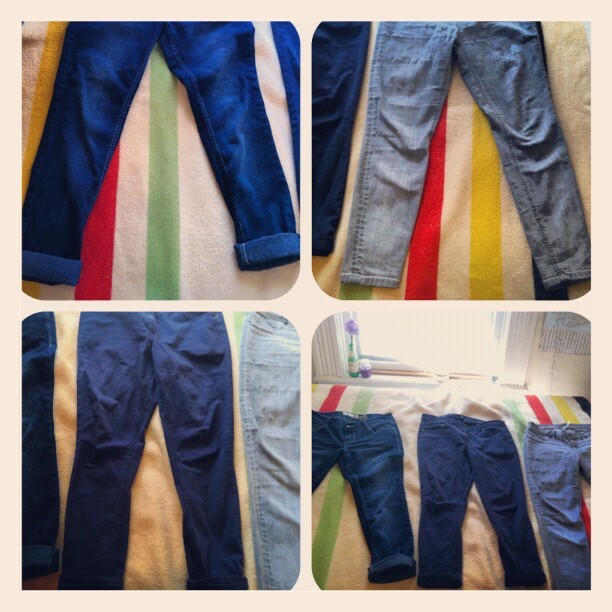 Clockwise from Left: Both jeans. Only 2 I wear out. 1. If you’ve never, try Express jeans. (Work pants, too, while you’re at it!) They last forever. That pair on the left has seen some rough times & all it has to show for it? Tiny pin-hole in the knee like it’s a badge of honor. 2. Jegging. This post about the Fun. concert will show many of the same pieces here, arranged into outfits, & it will also define the varying types of jegging, if you will. Cozy doesn’t have a time of day. 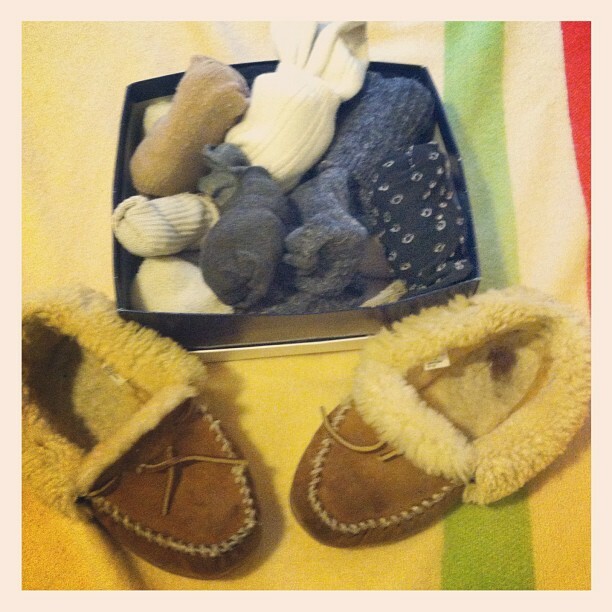 Top: Box ‘o’ socks for use with ‘jamas, & also quite chic atop a skinny to pad the riding boot. 1. Must-have knee-high socks. Trend started last year. Not going away this year. Or probably next. But goes beyond fashion. Also incredibly functional. Add sass to your step, yes, & warmth to your toes. Also easy transition into the pajama. I don’t hate that. 2. Buy these slippers. Ask for them for your birthday. Even if it’s in July. Your feet and your soul will thank you.